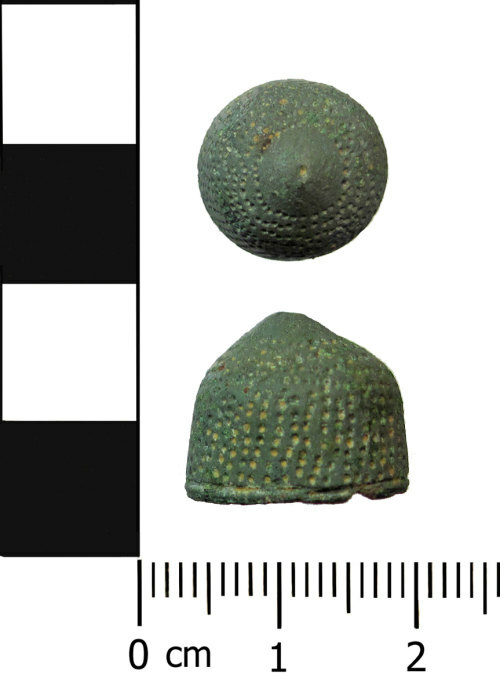 A complete medieval to early post-medieval copper alloy closed thimble, dating from c. AD 1400 - 1550. The thimble is beehive shaped with a domed, 'tonsure' top (Holmes 1988; 3) and flaring sides. There is a small notch on the lower edge, probably from construction. The circular pits are hand-drilled and arranged in vertical lines (becoming more angled and even diagonal in places) around the walls. Around the domed end of the thimble the drilled pits are in an apparent spiral; the very centre is undecorated (the 'tonsure') with a single pit in the very peak. See Holmes Sewing Thimbles FRG Datasheet 9.